I am often asked questions like the following: Can you please send me information on strokes. I am a goal keeper and had a stroke against me on Wednesday and I missed it. I think it was probably because I didn’t dive but rather reached out for it with my leg. How do I know when to dive or how, and how do I read them so that I can at least dive in the right direction. Can you also tell me how to build up my confidence on diving so that I can dive correctly. Penalty strokes, mention the words and depending on your experiences, you either love them or hate them. You either won the game or lost it, all on the whim of an umpire and the push of the ball. It’s never that simple, and neither are strokes. Penalty strokes are a part of the game and a keeper has to deal with them. The problem is how. 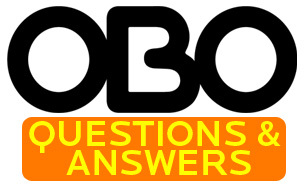 For most questions there are absolute answers. Penalty strokes are one of the least absolute parts of the game, especially when it comes to how to deal with them. For every absolute, I can think of a dozen exceptions. First off, there is no one way to deal with strokes and the more information you can assemble, the more tools you have for dealing with them. Rachel has a tip on penalty strokes and it has a lot of relevant information. In our tips, we share experiences as players and coaches. You have your own experiences and the opportunity to learn from the keepers you play against and the strokers you’ve faced. Take advantage of them all to develop the best plan for you. These are some of the tools I’ve used to try to be successful with penalty strokes. Note the word “try.” A penalty stroke is a severe penalty awarded for an intentional foul inside the circle or a foul that prevents a certain goal. The penalty is not designed to give the fouled team a good chance to score. It’s designed to give them an excellent chance to score. A well taken penalty stroke should go in. Having said that, not every penalty stroke is well taken and even the well taken stroke can be saved. Knowledge is a tool and dealing with penalty strokes starts with knowing the rules and procedures for the taking of a stroke. The penalty stroke is a flick or push taken from seven yards away from the goal. The stroker is allowed one step to take the stroke. The stroker must start with both feet behind the stroke mark when setting up to take the stroke. The player may not hit, slap or drag-flick the ball. The drag flick modification is a recent change in response to players slinging the ball in closer than seven yards when they release the ball off their stick. The stroker may only touch the ball once while taking their stroke. Proper procedure calls for the umpire to “confirm” that stroker and keeper are ready. The check can be verbal or simple visual contact. If for some reason, you’re not “ready” when the stroke is about to be taken, make sure the umpire knows it by saying “no,” or raising your hand. Umpires are not sympathetic to time-wasting, but there are legitimate reasons to step off the line. Once it’s established both keeper and stroker are ready, the umpire will blow the whistle for the stroke to be taken. The stroker does not have to take the stroke as soon as the whistle is blown, but there can not be an excessive delay between the whistle and the stroke. Rules that pertain to the keeper are that the keeper must stand on the goal line until the stroke is taken. 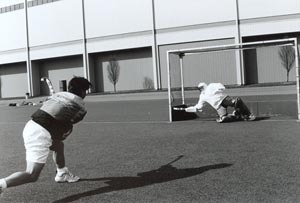 Standing on the goal line is interpreted as the keeper having a portion of his or her foot on or above the plane of the goal line. That means a keeper doesn’t need to stand with their toes on the goal line, he can stand with his weight on the balls of his feet slightly in front of the goal line as long as his heels are along the plane of the goal line. That’s an important distinction because it allows the keeper to cut down some angle as he extends to the sides to make a save. The keeper may not move his feet, but he doesn’t have to be motionless when the stroke is taken. The keeper can rock, shift his weight or move his hands while waiting for the stroke to be taken, as long as he doesn’t move his feet. If the stroker violates any part of the procedure for a stroke, a 16-yard hit is awarded. Typical violations for the stroker are taking two steps on the stroke, making two touches while taking the stroke or taking the stroke before the whistle is blown. If a keeper commits a violation, a goal is awarded. The biggest violation for keepers is moving before the stroke is taken. If you have any questions about the procedures for how a stroke is to be taken, make sure you ask the umpire before getting in the goal before the stroke is taken. While you don’t want to get in the routine of giving up strokes, having a routine for strokes is a good idea. Once a stroke is called, as a keeper it’s important to detach yourself from what’s just happened and get ready for what’s coming next. Mentally, that may be something as simple as stepping out of the goal for a second while the stroke is being set up and focusing your thoughts. Time is stopped for a penalty stroke so there’s no need to race into the goal. 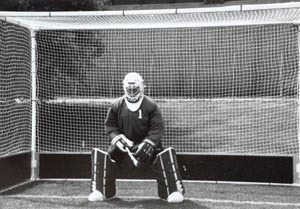 In years past some keepers used the time stoppage for the stroke to put pressure on the stroker. They took their helmet off, removed their hand protectors and loosened and tightened a strap that was already fine, all in the name of “icing” a stroker. The rules don’t allow this anymore and the penalty can be a goal or a card. A keeper doesn’t want to take a stroke if he’s got a loose strap, and if you’ve got sweat in your eyes, by all means wipe your brow, but these shouldn’t be a part of your routine. My routine took maybe ten seconds and it was done while the stroke was being set up. I stepped out of the goal, took a couple of seconds to stretch and to mentally focus on the job at hand and got back in the goal ready to save the stroke. There is a mental component to saving strokes and a lot of it comes from having confidence in your ability to save a push or flick from seven yards from goal. If you don’t believe you will save a stroke, you won’t. That’s not to say that you’ll save every stroke, but you need to believe in your ability to save the shot. A stroker knows when a keeper believes in himself. He sees it in your stance, he sees it in your eyes and he sees it in how you step up for the stroke. A keeper’s routine and approach to the stroke have to be natural. You have to believe in what you’re doing. 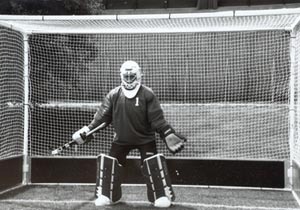 A stroker can tell the difference between a keeper standing in goal and a keeper set to save a stroke. We’ve talked a little about where to stand on the goal line when setting up for the stroke (heels above the goal line), but once you get past that there are different philosophies on stances for saving a stroke. The best stance for you will depend on the level you play at, your size and your reaction time. There is a big difference between the strokes taken in an Olympic final stroke off and what you might see at an under-12 game. How you stand is influenced by what you’re expecting. As a keeper, while I believed that I could save any stroke, my primary goal was to save the savable. As I mentioned before, well taken strokes should go in. The stroke I don’t want to allow is the poorly taken one. Saving the savable should keep a keeper in a stance fairly close to his normal ready position. Typically, that’s with your feet shoulder width apart so you can explode to either side, with your weight on the balls of your feet, knees and waist slightly bent. You want to be in a position that allows you the best opportunity to react to any shot at goal. Stance will effect how a keeper can save a ball and going back to philosophies, it’s a matter of what you’re trying to save. Many keepers ask whether it is better to dive or go with their legs to make saves on low shots to the corners. How you set up in your stance will dictate the save you can make. I found I was most effective saving strokes by playing in a compact, explosive stance. The stance allowed me to dive down and out to get to shots to the low corners. I had the size and reactions to be able to get to the high corners. I play with my hands very forward in my ready position. I find that having my hands forward and somewhat close together helps me with diving because my weight is forward. I’m looking to go to the ball with my hands, even shots to the low corners. My goal is to attack the ball and get out to the stroke. By trying to make the save as early as possible, I take away angle as I extend to the side. That means I don’t have to get as wide and lessens the chance of the stroke hitting me and deflecting in (particularly with my stick). The distance between your feet in your stance will also dictate how you can react to the ball. Keepers with their feet close together often fall to the ball as they don’t have a base to push off to the ball. Keepers with their feet very wide usually end up flopping to the ball. Either way, these keepers usually end up diving to balls in the corners. If they’re successful saving, there’s nothing wrong with the stance. Another school of thought has that the keeper should look to make himself big. He’ll carry his arms out in a fairly upright stance trying to fill as much of the goal as he can. At higher levels of play, particularly with strokers who can stroke hard and high, this can be an effective tactic. 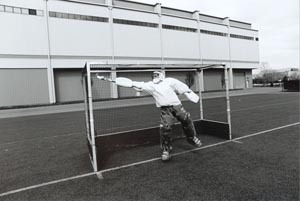 In this stance, the keeper is looking to reduce the distance he has to react to the shot because he’s made himself big. The keeper is basically looking to drop to get to shots to the low corners and stepping to reach shots to the high corners. The keeper making themself big, hands are outside the body. A big part of saving strokes is knowing how you can save a shot when it’s taken to a particular spot on goal. That comes from repetition. Strokes low to a keeper’s right can be saved with a foot or a stick, low to the left can be saved with a hand or a foot, high right with a stick or a hand, etc. For younger keepers, it’s often useful to train by having them save strokes where they know where the ball is going. They need to learn the mechanics of saving, whether that’s by reaching with their legs or diving. 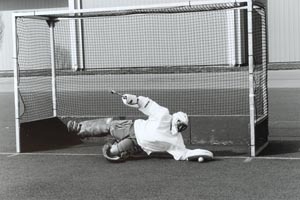 Until a keeper makes a save on a stroke, they don’t know which way is best for them. By training with strokes taken to a known spot, the keeper is provided with that opportunity and is allowed to train the reaction. As I mentioned, what stance is best for you will depend on the strokers you face, your size and speed. A smaller keeper physically can’t get to low shots to the corners with his legs, he’s going to dive which is going to require an explosive stance. A slower keeper won’t have the reactions to be as explosive and will have to make himself big. There is room for variation within the stance. It isn’t one or the other. A keeper develops the stance that works for them based on experience and experience means trying different things. Prepare for frustration when you’re trying new things with stance on strokes. For many keepers, strokes are uncomfortable to start off with. I can’t count the number of times I’ve seen a keeper go back to their old ways after trying a new stance for a whopping three strokes in practice. Be prepared to try something for a month, for a hundred strokes, for as long as it takes to get comfortable with it and then make an evaluation based on fact, not feel. As a coach, there are a number of things to consider when training for strokes. Is the training for the keeper, or the stroker? When training a keeper for strokes, part of the training is building confidence. Confidence comes with saves and success, something most strokers don’t want to give a keeper. Fatigue and frustration can also affect a keeper’s confidence. Have a plan for what you want and how you’re going to get it. Also be prepared to have a back up plan if practice becomes negative. Finally, a note on “guessing” on strokes; a keeper should avoid guessing on strokes. I might anticipate where a stroker is going, but I need to base that anticipation on prior knowledge. At higher levels of play, scouting is an important part of game preparation. It entails having knowledge of who an opponent’s strokers are, how they set up and where they shoot. I may set up differently if I know where a stroker goes. I may anticipate where they shoot, but I still need to react to the ball. Just as you might have information on a stroker, he’s just as likely to have information on your tendencies. I hear keeper’s say that if a stroker looks one way, or sets their feet up a certain way, he’ll shoot to this spot. For every one of these certain cues, I’ve seen a stroker go a completely different place. Nothing is more disheartening to a team than to have a stroker push the ball in the middle of the goal as you’re diving to the corner. My experience has been that when I focused on the ball and not the stroker, I had the most success saving the stroke. Like any goal shot, great strokes will go in, average strokes shouldn’t. As keepers we don’t like to concede anything, but if we take the approach that we’re going to save the savable we go a long way to making strokes more manageable. Penalty strokes are nothing more than a push from seven yards. Practice them, get comfortable with them and deal with them. I have been goalkeeping for 3 years now and I am 16. I now play for the Cambridge (England) fourth team. I have noticed that penalty flicks are ever increasingly going to my right. When standing in the middle of the goal it is too far to make a save with our foot and too close to dive down with my stick. Can you suggest how I might be able to save these? I am also thinking of buying some Cloud 9 kickers and legguards. Would you say it is really worth spending the extra money for Robo legguards at the men’s level I am playing at? As far as penalty strokes go, I would suggest you think about your positioning. Unless you’re very big and flexible, it’s hard to get to the low corners with your feet. Typically, I’m most successful getting to those shots by diving. Work on keeping your feet about shoulder width apart with the weight on the balls of your feet. Look to explode, pushing off from both of your feet and try to get those shots with your hands or stick, especially for the low ones to your right. Penalty flicks are equal parts skill, reaction, intuition and sometimes luck. The thing that I would offer to you when you buy pads is to think of the level you want to play at. If you plan on playing seriously for a while, I would recommend the Robo. I’m a well respected keeper in Ireland, and need help. When you are talking at the back, what should one say, because my captain keeps saying I’m not saying constructive things, but my coach says that I’m fine. Also, this is going to sound strange, but at the moment, I can’t concentrate on the game, and aren’t making the outstanding saves I used to make. I am confident, and am still willing to do anything to keep the ball out of the net, but I have tried to tell my coach about it, but all she says is that I’ve got too many coaches coaching me that I’ve got too much information. Any suggestions will be much appreciated. I think the bottom line with communication is “what is the result of it?” If players do what you ask, it’s effective communication. If not, you need to find out what it takes to get people to do what you want. Some people respond to simple, direct instructions, others need to be clued in at urgent times and you’re going to convey that with your voice. Obviously your rapport with team-mates can influence things. Constructive comments are always appreciated. You’re the best judge of whether people are doing what you want. If they are, you’re fine, if not, you’ve got to tinker. As far as confidence and making the outstanding save, outstanding saves happen, I don’t worry about making that save all the time, I found I had my most confidence when I made the routine save, automatic. There was no doubt I could do the skill and I did it. Confidence comes from reading situations and successfully defending them. Finally, I don’t know that you can have too many coaches. Coaches are information and I don’t know that you can have too much information. Now there’s nothing to say you have to use all that information, but thinking about things reinforces and clarifies issues. What kind of shoes you should wear depends on the surface you play on and the conditions you play in. If you play on grass, a cleat is usually the best shoe, but not one that is too grabby. Those are the kind that have 8-10 big, long cleats on the bottom. Those are only really good when you play on long, wet grass. If you play on astroturf, the shoe will depend on the kind of turf and whether the pitch is dry or wet. If the pitch is dry, or sand-filled, you can wear flats, either like a basketball shoe, tennis shoe or cross-trainer. If you play on wet turf, look for hockey shoes designed for wet turfs. They’re multi-cleated shoes with small cleat and lots of them. The big thing you don’t want to have is a shoe that you’re going to slip in when you move or stick when you extend to make a save. Author adminPosted on September 14, 2002 May 25, 2016 Categories OBO Online ExpertTags Q and ALeave a comment on What shoes? I’m not a big proponent of the technique where you go down on one knee as a set up to logging. As you’ve noticed, the technique is good on hit shots, but drag flicks present a big problem. Your weight is committed to the knee and you’re basically rooted. You can stay with this technique and try making an adjustment to keeping your weight more on your left foot as opposed to your right knee, but with a good drag flick to the upper corners, even that will find you lacking. At the level you’re playing at, I’d suggest more of a stance where you’re in a lean, to get down. The following is a summary of the technique. You’re starting in a position on the corner where you are square to the stick stopper and shooter as opposed to being square to the pusher outer. On the push out you’re looking to get out three to four yards. On the stop, you are set with your feet about a yard apart, your right foot is inside your right shoulder and your left foot is about eighteen inches to two feet outside your left shoulder with your knees slightly bent. These distances will vary depending on your height. The big thing is, you’re leaning to your right as you face out from the goal. To get down on a hit shot, you collapse your right. This allows you to drop down on to your side to log. To make yourself as big as possible, you straighten out your right leg and drop down on your hip. On balls that are struck to your far right, you can push off with your left foot to fully extend. When you’re down, you’re trying to do the same things as when you log out from being on a knee. You want your legs straight out, you want your hips and shoulders perpendicular to the ground or slightly forward so when the ball strikes you, it doesn’t deflect back and up in to the goal. You want to watch the ball all the way on to your body. The strength of this stance is the flexibility it allows you on drag flicks or variations. On drag flicks, you can easily get yourself in to a balanced position by just getting your right foot outside your shoulder so that you can cover the upper corners of the goal. With that one adjustment, you’re basically back in to a set position for the shot. The same principle allows you to easily change your positioning with the changes of angle that come with variations on corners. Like any change, it will take a while to get comfortable. You’ll need to work on footwork and getting down from a slightly higher position, but as you get more comfortable, I think you’ll find that you can cover struck shots just as well and will have more success with good drag flicks. Author adminPosted on September 14, 2002 May 28, 2009 Categories OBO Online ExpertTags Q and ALeave a comment on Should I change my technique? I was playing for a team and then I changed to a new one cause it lost all of it’s life (because of the money) and in the new team, the coach is an international player who happened to be a goalie, I was very happy at first cause I thought I’d learn a lot but it’s a year from that and he refuses to teach me anything by making himself as a fool so I’ve begged him to teach me and I don’t know what to do and I’d think I can improve my skills if he does, so have you got any ideas? If you haven’t already, ask to sit down and talk to him away from practice and your team-mates. I think one of the biggest obstacles to getting good coaching is communication. If you can express to him your frustration and that you look at him and his knowledge as an asset, he may be more willing to share his experience. I have two questions, both with are a result of recent experiences indoors (I’m a great believer in the positive value of Indoor keeping). 2. If I don’t charge a short corner for whatever reason a get in the "set" position. However I used to play in goal for a foot ball team and I can set myself too low. A number of times the ball hits the net and the words stand tall ring round my helmet; but I think there is a more fundamental problem with my technique. When a ball comes straight at me the simplest thing to do is stand tall and let it bounce off my chest plate. Instead, and this is where football comes in, I try to play the ball with stick and glove. In order to do this I shift my weight so that I fall back and then twist my torso to bring round my hands. I know I should not, but it only happens on the fastest shots that are at my shoulders, either side of the helmet, when it is a reflex action. Do you have any suggestions/drills that will help me with these shots/my technique? In regards to your two questions, first about sliding on tacky, indoor surfaces. If you can generate a meter on a slide, that’s all you really need. The distance you slide isn’t as important as your position in the slide. The thing I find, when I slide on a sticky surface, is that my hip sticks and I almost end up rolling forward on my stomach. That prevents me from presenting as big a block when I slide. For that reason, the one thing I would suggest when sliding on a rubber floor is adjusting your slide so that your weight is slightly back, usually by keeping your top shoulder and hip slightly back. When you do plant and roll slightly forward, that will get you in a position where your hips and shoulders are perpendicular to the floor in your slide tackle position. The other thing about sliding, I need to be able to recover and get up after my slide tackle. That’s pretty difficult if I’m sliding two or three meters like you can on wood floors. As far as indoor corners, I think the biggest thing you’re recognising is bigger is better. The closer you can get to the actual shot, the better your chances of getting hit with it. The problem that happens when most keepers slide, rather than going out and staying up, is that they don’t get close enough to the shot and a horizontal keeper two meters away from the shot isn’t much of an obstacle. If I’m charging on a corner, I don’t try to react to the ball if it’s going to hit me. I play with an ice hockey keeper’s body and arm pads and am very comfortable getting hit with shots straight at me, particularly the inside of my arms. That allows me a couple of things, one if I’m charging and the ball hits me in the upper body at the top of the circle, rebounds carry out of the circle. Second, the only thing I need to react to is shots wide of my body, which at that range might also be wide of the goal. I wouldn’t recommend falling backwards and trying to parry balls with your hands from close range unless you’re very good at it. It’s like swatting at flies, very hit or miss. Also, I don’t know how comfortable that makes the rest of your defence feel. Finally, I don’t know that there are any drills per se, short of practising these situations. Work on forwards taking you on at the top of the circle. Do short corners ad nauseum. Repetition brings comfort and with comfort comes success. I would like some help please. I am 16 and was playing for my local mens’ team on Saturday and had a ball drilled into my face from 4 yards. This shook me up loads but I wasn’t hurt. I then played in a national cup match on Sunday and played so badly. I was always on my line and wasn’t committing to take the ball and control my D. I knew what I was doing wrong but still I didn’t want to correct it. I was just wondering if you’ve had any experiences like this and if so what you did or if you have any advice for me? Welcome to the position! I can tell you I’ve had experience with your sensation. I started playing back in the day before head gear was required and can tell you, I was one of the idiots that played without a helmet or mask for my first two years. I thought that was the brave thing to do. First off, don’t ever do it (play without head protection), even just knocking around in practice. The good news is your head gear works, you weren’t hurt. Still, it can be very unsettling. One of the first lessons I was taught as a keeper is “you’ve got to take the knock, son.” If you get hit, get back in goal and don’t let the last experience you have being injured. Sometimes that’s easier said then done. I think you’ve learned one important lesson, that when you play afraid, you don’t play effectively. Not only do you not play effectively, my experience has been that when I play afraid, that’s when I get hurt. Hang in there, if your equipment is good, you may get shaken up, but you won’t get hurt if you play with courage. Basically all of the skills discussed on the web site are just as applicable on grass as they are on turf. I talk about artificial turf because most hockey outside of high school hockey in the United States is played on a surface other than grass. Slide tackling is certainly a skill that can be done on grass and well maintained grass fields are great. It’s when grass isn’t in good shape and you start to get adventurous bounces that technique starts to become an issue. You can try anything Rachel and I have spoken about in the different tips we’ve written on grass, you just need to evaluate whether they’re working for you on the surface and at the level you’re playing at. Thanks for reading. I’m writing in regards to GK drills for Indoor hockey. If you have the time would you mind forwarding some to me? I don’t know that I have any brilliant drills for indoor as much as ideas on how to modify drills for outdoor to fit the technical and tactical requirements of indoor. The big thing I try to emphasise with keepers for indoor tactically is the concept of defending the circle using the keeper’s privileges for using the whole body to tackle and defend. That doesn’t mean just going out and throwing yourself on the ground. Drill-wise, or more accurately situation-wise, I like a lot of forward and the keeper stuff from different approach angles in to the circle. We’ll build on that and do two forwards versus a defender and a keeper, emphasising that the keeper has to mark as well as defend the goal. You can flip it so that the keeper is the primary defender on the ball and the other defender is marking the second forward. You can build on that and throw in a third forward with a recovering defender. Indoor is excellent for emphasising that the pass can be more dangerous than the shot. Anticipation and mobility is crucial. Technically, nothing is more important than being able to control the shot. Rebounds and lifted saves are disastrous in the indoor game. We do a lot of repetition work with simple shots at the keeper focusing on having the skill to clear low shots on the ground and the patience to cover lifted shots by getting your body behind the ball, waiting for the ball to settle and playing it out. I think the big thing to think about in setting up your indoor practices for keepers is the situations that happen in games that you want to recreate. Baseline balls, deflections, set pieces, odd-man situations, they’re all things that happen in games so set them up in practices. I hope that helps.